When you�re out on the run from one chore to the next, having all the tools that you will need along for the ride can help make the day go a lot smoother. Whether you go from chore to chore in you Polaris Ranger or Yamaha Rhino, keeping your tools organized keeps your bed free of clutter and makes locating those essential items to get the job done more efficiently. 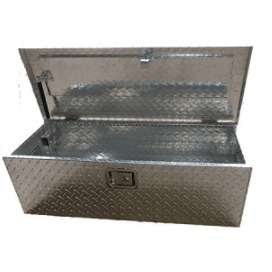 With the Universal Diamond Plate Aluminum Medium Tool Box by Hornet Outdoors, keeping necessary equipment together in one safe place is as easy as closing the lid. Handles on both ends makes hauling in and out of the bed super simple along with all welded seems, to prevent moisture from getting in and rusting stuff out. 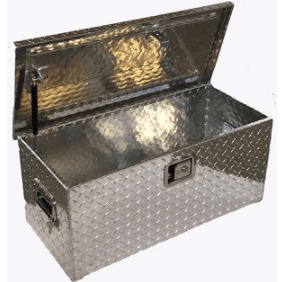 A gas shock lid prevents from slamming and stays stationary while getting out the necessary hardware needed for the job. 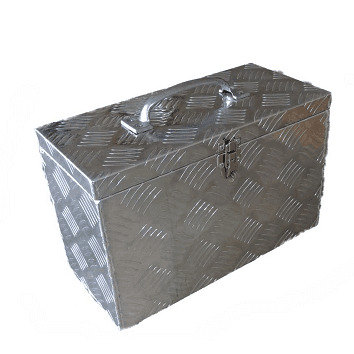 From its durable diamond plated design to its keyed locks, this tool box is sure to keep the necessities out of harm�s way. Get yours today here at Side By Side Stuff! Length 24" Width 9.5" Height 12.5"
Shared Shipping Program: You pay just $6.00 shipping/handling and Side By Side Stuff pays the rest!